When Officer Jessie Mach is crippled after an assault by an old enemy, his time on motorcycle field duty seems finished. That is before Norman Tuttle recruits him for a secret government project. Mach is to be the test pilot for the Street Hawk, an advanced motorcycle that carries tremendous firepower and is capable of safely controlled periods of speed of over 300 MPH in an urban environment. This deal includes special surgery to repair his legs while keeping him the facade that he is still handicapped. Unfortunately for Tuttle, who can monitor the action from mission control, Jessie insists on getting involved in stopping crime rather than the simple tests Tuttle wants. So now the city has the additional protection of the mysterious superhero known as Street Hawk. Like many 80's shows, this one lived on in my memory - another high tech show (or high tech by 80's standards). The cast were likable enough to carry off the often corny scripts, and the bike itself was amazing...............who can forget the countdown to Hyperthrust. Control centre looks dated now, but remember this was the 80's when computers were large. A show that could've gone further, and even an early appearance from George Clooney in one episode. Don't expect Shakespearian quality scripts, but it's a fun ride.........especially watching the bike jump through 360 degrees. Yeah well, KNIGHT RIDER made it because a 4 wheel crime-buster was always going to win out over a two-wheeled vigilantemobile! Street Hawk's "Harley with attitude" might have had a 200 mph speed capability and a $3 million price tag (bit suss, that one!) 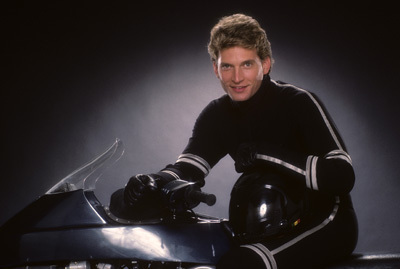 but when all was said and done, Rex Smith was no Steve McQueen! More like crime-fighter Disney style. Best of the offerings, the actual Pilot telemovie entitled STREET HAWK. It ran for 75 minutes and was released in many countries as a one-off video. (I have a copy!) Besides some skimpy background to Street Hawk's existence - The rookie cop, consigned to Public Relations, mega-bike wages war against the local "Mr Big" (Christopher Lloyd in a most un-Disney role). Not only does Jess Mach (Smith) take out Lloyd's cronies, he performs an aerial ballet that sees Lloyd and his 4 Wheel drive nose dive DUEL style off a desert cliff! 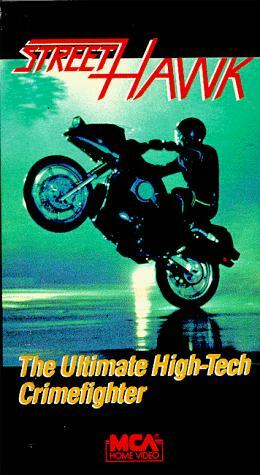 Music by Tangerine Dream was certainly a plus, although suspiciously ripped off from the NZ scifi actioner BATTLETRUCK, which coincidentally features a hero riding a superbike!